Mathematics, whether it be calculus homework or cutting-edge research, can be very challenging. Haven’t we all faced a problem that we struggle with for hours or days? The answer, we know, or we hope, is within our grasp—but we just can’t reach it. In moments like that I always think of this picture from the famous puzzle-master Sam Loyd (who I wrote about once before). It can be found in Sam Loyd’s 1914 Cyclopedia of Puzzles (scans of the entire book are available online). People became infatuated with the puzzle and ludicrous tales are told of shopkeepers who neglected to open their stores; of a distinguished clergyman who stood under a street lamp all through a wintry night trying to recall the way he had performed the feat… Pilots are said to have wrecked their ships, engineers rush their trains past stations and businessmen became demoralized… Farmers are known to have deserted their plows and I have taken one of such instances as an illustration for the sketch. Unfortunately mathematical research is often too much like this picture—Loyd never paid out the $1000 because his 15-puzzle is impossible to solve. The proof of impossibility is a nice application of group theory. Johnson and Story gave the first proof in 1879 (you can find their article here, although it may require a password; see this article for a more modern treatment). Incidentally, Sam Loyd insisted until his death in 1911 that he invented the puzzle. However, in a recent book (that has a whopping 3 subtitles! 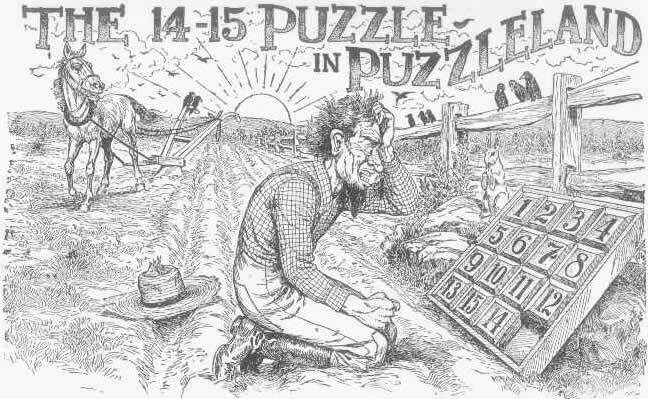 ), The 15 Puzzle: How It Drove the World Crazy; The Puzzle That Started the Craze of 1880; How America’s Greatest Puzzle Designer, Sam Loyd, Fooled Everyone for 115 Years, Jerry Slocum and Dic Sonneveld show that this was another instance of Loyd’s trickery and deception. They investigated the the origin of the puzzle and discovered that Loyd was not the inventor. The puzzle was invented around 1874 by Noyes Palmer Chapman, a postmaster from Canastota, New York. By coincidence, my six year old gave me the (regular) puzzle last night and was amazed that I could solve it. I was tempted to pry out the tiles and reassemble it into the impossible form before returning it to him, but that might be considered abuse. Oh! That might be abuse, but it certainly is tempting. Alas, Daughter is only 18 months old, so she would merely destroy the thing and smile. I’m wondering why I can consistently solve the puzzle (sometimes in under 30 seconds) if it made of numbers 1-15 but I find it impossible to solve the puzzle it is made of a picture.